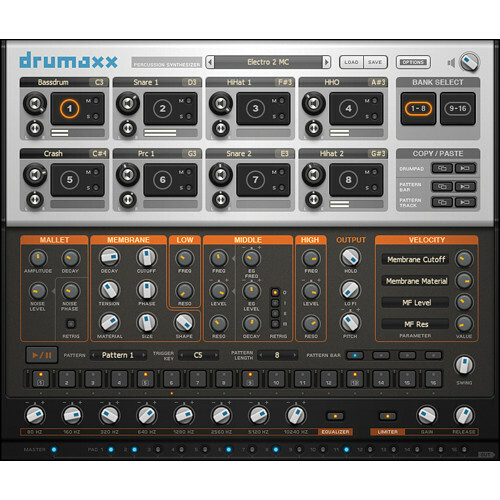 The Image-Line Drumaxx Percussion Modeler VSTi Plug-in (Electronic Download) is a 16 pad virtual percussion instrument that gives you expressive control over physically modeled drum sounds. The software doesn't use pre-recorded samples or synthesis, but rather a complex algorithm that models a drum membrane as a mesh of interconnected points with variables such as stiffness, damping, mass, and inertia. Within the plug-in, you can control parameters such as drum head material, tension, shape, thickness, drum body size, drum body shape, drum body material, and vibration dampening to customize the sound. The software comes included with 130 preset drum kits, 900 drum patches, and 200 drum patterns. The library includes cymbals, snares, kicks, kettle drums and more. An integrated step sequencer with trigger-key playback allows you to build complex patterns and a velocity modulation matrix allows you to control the expression with which the drums are played. An integrated effect rack enables additional sound shaping possibilities.